When Daman and Kyann arrived at the Grand Hyatt at 1 AM, there was no curb cut. When Daman exited the cab, he had to travel down the street to the corner of the block in order to access the sidewalk. Daman’s trek was dangerous as it was dark but traffic was still a continuous flow of cars on east 42nd street. Another unwelcoming and a bit unnerving event occurred upon arrival. A random man decided to help them. He just picked up their luggage and walked into the hotel with it–Kyann did not want him to assist her and voiced this to him. The security man allowed this total stranger to walk off with Kyann and her mom’s stuff but did eventually track him down. Fortunately, all of their stuff was found. So be wary, random people may help you with your stuff even if you voice otherwise. The building itself is accessible, but in this case, “accessible” is defined as not the most direct route nor time sensitive. Like many other hotels, the understanding of accessibility and how to appropriately interact with people with disabilities varies greatly. When Daman and Kyann arrived, Daman was not accommodated with an accessible room that had a roll-in shower. This is frustrating as Kyann had called ahead, the hotel told Kyann that Daman would have a room with a roll-in shower and they even sent Daman a confirmation email saying he would have a roll-in shower. The room Daman was given was neither an ADA room nor did it have a roll-in shower. The hotel did give Daman a $75 dining credit; Daman could eat for free but could not shower. Seems like a stinky tradeoff. The hotel did move Daman to a new room the following day. However, the roll-in shower did not have a built-in seat. Both Daman and Kyann asked for portable bath seats; Daman received one, Kyann did not. However, the bath-chair that Daman received did not have a back on it so he could not use it. Kyann took Daman’s bath-chair and Daman asked for one with a back on it. Maintenance had to assemble a bath-chair for Daman and by 10 PM on the second day, Daman finally received the accommodations he had asked for two months in advance. The most frustrating event that occurred while staying at the hotel, however, was how Daman and Kyann’s waitress at the hotel restaurant (on the mezzanine) treated them. The waitress’ behavior was demeaning and inappropriate. She kept touching Daman’s shoulder and calling him childish names (baby, honey, sweety). She assumed that Daman and Kyann were brother and sister. It can only be assumed that she thought this because both Daman and Kyann use wheelchairs. When Daman asked for a straw, the waitress brought him a paper one. Daman is not able to use paper straws, so he used a plastic one that he carries with him. The waitress made a comment about global warming. Daman then asked for the bill; the waitress brought it to Kyann’s mom. Kyann’s mom did not pay, Daman did. Otherwise, we had a nice stay. New York City is compiled of tall buildings, roads, and sidewalks. The traffic and congestion, both by people driving and walking, reinforces the fast-paced stereotyped environment of NYC. The steady stream of people is nerve-wracking; people mindlessly walk down the sidewalk and across the street with the flow of pedestrians. Many have their headphones in and/or trek on while gazing at the screen on their phone. “Chicken” was often played with random people who had no idea that they were actually involved in this head-on game. People would also stand in the middle of the curb cuts. With a sea of bodies vying for sidewalk space, it was frustrating for Kyann to have to yell at the top of her lungs (otherwise the people standing in the curb cuts could not hear her) three or four times, “Excuse me! Excuse me!” and most of the time it took another stranger pulling the person out of the way as they never heard Kyann asking them to please let her pass. Access is more than just the curb cut itself. It is having access to the curb cut. It is incredibly important that people be educated that the curb cut is there for a reason–especially in a fast-paced environment such as NYC where drivers are not patient enough to wait for you to exit the street onto the sidewalk. The first day we ate breakfast in NYC we ate the fruit and pastries that were provided by the conference that we were with, which was great but we were quickly hungry. Kyann’s mom mentioned to Daman that she would like an omelet. So the next morning, he googled “omelets near me” and Pershing Square popped up. Accessibility wise, it was accessible. The entrance was ramped, but steep, and even though the restaurant itself could be accessed, the bathroom was upstairs. The food was good, but the price not so great. Welcome to NYC! When visiting or living in NYC, one can take advantage of the incredibly intricate train system hidden beneath the city. However, for anyone who is not able to access the stairs, like our CEO and Chief Accessibility Officer, the convenience of traveling beneath a congested city can be a daunting task. Only about one-fifth of the NYC subway stations are accessible. This means that many stations only have accessibility accommodations in one direction or they are not accessible at all. Nevertheless, Kyann decided on adventuring to Brooklyn via the subway system. The Grand Central Station is located under the Grand Hyatt, right below where Kyann and Daman were staying. This station is fully accessible. So, Kyann and her mom, left Daman and his friend, Nate, to explore Manhattan, and traveled down the hall leading under the city. Then they took an elevator down even further below to where the trains run where they hopped on the Four which took them to the Brooklyn Bridge station, trusting the entire time that there would be an elevator on the other end. And, there was! Kyann and her mom rode the elevator up to the street and walked to the top of the Brooklyn Bridge! Kyann was so thrilled to see the Brooklyn Bridge as she had been to NYC once before but did not make it to Brooklyn. They then ventured to a nearby Indian restaurant, A Saffron, where they enjoyed a large plate of Tikka Masala. This restaurant is accessible, but there is not a bathroom, for anyone, so no need to worry about accessibility there. Now for the fun part. To travel back to the Grand Hyatt, Kyann and her mom asked a subway worker the Brooklyn Bridge station heading downtown how to return uptown. The worker told them to walk over to the entrance on Chambers Street. However, when they got to the entrance, it did not have an elevator–just a small mountain of stairs down. Kyann’s mom was preparing herself to carry Kyann and her chair down the stairs when she spotted a police officer. So, Kyann and her mom asked the police officer about an accessible entrance in which they found the police officer had no idea. A man overheard their conversation and referred to the elevator back at the Brooklyn Bridge station that heads in the opposite direction that they needed to go. Two ladies overheard the gentleman trying to help them and expressed that a couple blocks away the Fulton station had full amenities including elevators. They even offered to show Kyann and her mom where the entrance was. To Kyann’s relief, this station also had a very clean bathroom. 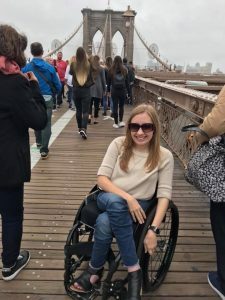 Even though the subway is very inaccessible, as a person in a wheelchair, Kyann would love to utilize the subway–for someone who cannot drive, it is so freeing to be able to travel as one chooses by utilizing the subway. Kyann cherishes every time she has the opportunity to successfully ride public transportation as it gives her the independence she desires. Kyann and her mom returned to the hotel to have a relaxing night while Daman and Nate enjoyed the concert in Central Park. Stay tuned to hear more about the Summit and the concert in Central Park.